The Young Men's Magazine manuscript is certainly the big star in the upcoming Sotheby's auction (December 15th) we have been posting about. But it is not the only item to be auctioned. 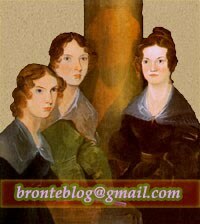 In this series of posts we try to give details of all the Brontë lots. Unpublished miniature autograph manuscript written in minuscule script, comprising title page (p.1), half-title and contents (p.2), "A letter from Lord Charles Wellesley" (pp.3-10), "The Midnight Song" (pp.11-14), "Journal of a Frenchman [continued]" (pp.14-18), "Advertisements" ("...Six young men wish to let themselves all a hire for the purpose of cleaning out pockets they are in reduced CIRCUMSTANCES...") (p.19), blank except for "Em R" in a different hand (p.20), the manuscript being composed of five bifolia, each produced individually and varying in size by up to 3mm, folded into a single gathering and stab-stitched in brown paper wrappers with "SEPTEMBER 1830" inscribed on the upper cover, 20 pages, 35 x 61mm, in a red folder and brown morocco slip-off case (50 x 70mm) with gilt lettering on the spine ("Young Men's Magazine C. Brontë Sept. 1830"), in exceptional condition but with tiny nick to second leaf, without paper loss. On Charlotte Brontë's death in 1855 her surviving manuscripts passed to her widower, the Rev. Arthur Nicholls, who moved to Ireland in 1861. In 1895 Nicholls was approached by Clement Shorter, acting on behalf of the bibliographer, collector, and forger T.J. Wise, who purchased the bulk of the manuscripts for £400. No complete list of these manuscripts is known but since this manuscript was not included among the residue of Nicholls's collection (sold in these rooms 26 July 1907, 19 June 1914, and 15 December 1916) it can be assumed that it was among Wise's purchases. Folders and slip-off cases similar to that protecting this manuscript are also found with some of the manuscripts from Wise's collection. Wise sold many of the individual manuscripts to a range of collectors, and this manuscript has remained in private ownership in Continental Europe until the present time. An unpublished manuscript containing three works by the young Charlotte Brontë never seen by scholars, this is undoubtedly the most important Brontë manuscript to have appeared at public auction in more than thirty years and one of only a handful of such manuscripts remaining in private hands. The "magazine" is set in the fantasy world of "Glass Town", the earliest of the fictional worlds created by the four Brontë siblings. had left the girls half-starved and susceptible to disease, leading to the death of Charlotte's two elder sisters Maria and Elizabeth (Charlotte's fury at the school finally found expression in her depiction of it as Lowood School in Jane Eyre). After this traumatic experience the four surviving children were educated at home, their unfettered imaginations fed by free access to their father's library. "...Papa bought Branwell some soldiers from Leeds. When Papa came home it was night and we were in bed, so the next morning Branwell came to our door with a box of soldiers. Emily and I jumped out of bed and I snatched one up and exclaimed, 'This is the Duke of Wellington! It shall be mine!'..." (Charlotte Brontë, The History of the Year, 12 March 1829). Following Charlotte's lead, each of the siblings took one soldier as their own and named them for a hero: Branwell chose Napoleon in a riposte to Charlotte's Wellington, whilst the younger sisters Emily and Anne named theirs for the explorers Edward Parry and William Ross. The children assembled a world – a "confederacy", in which all four siblings had their own realm – around these characters. It was a world assembled from the material to hand: prints of Biblical illustrations by John Martin hung in Haworth Parsonage, which formed the basis of the towering cities of Glass Town; the geography of their world was based on West Africa, about which they had read in the life of Mungo Park; from the Arabian Nights they took the four near-omnipotent Genii (one for each of the siblings) that hovered over the world, intervening at will; the texture of the world and the adventures of its inhabitants drew extensively on Blackwood's Magazine, to which their father subscribed. Magazine, she wrote a "Catalogue of my books with the periods of their completion" which totalled 22 volumes, all written in little more than 12 months. "[A]n immense amount of manuscript, in an inconceivably small space" was Mrs Gaskell's comment when she saw Charlotte's juvenilia. Its minute size is the most extraordinary physical feature of this manuscript, as it is of the other early works by Charlotte and her siblings. The manuscript offered here contains more than 4000 words crammed on to 19 pages (including the title page and half title) each of which is no more than 35 x 61mm. It must have been extraordinarily laborious work, especially as Charlotte's desire to replicate a printed magazine went so far as carefully printing out each individual letter. The tiny scale of the manuscript reflects the miniature nature of its subject, since Glass Town was originally populated by characters based on Branwell's toy soldiers, as well as its intimate nature – it was produced to be shared only among the four Brontë children. This imaginary world was intensely private and the miniature scale of these works ensured that they were easily hidden and indeed could only be read without a magnifying glass by the sharp eyes of a child. "...I looked up & beheld a boat softly floating down the canal: in it were seated 4 men three rowed and the other appeared to be struggling with something white but I could not perceive what. till they drew nearer then I saw it was that little girl Caroline Krista whom such a great stir has been made about since the publication of your last magazine..."
approached the bed & placed my hand (which was as cold as ice by reason of my having taken the precaution o[f] wetting it with water) on his brow. he started & opened his eyes "Caroline Krista sends the ghost of Charles Wellesley to dispatch you to the regions of the dead" said I in the most hollow tone I could muster.."
Fairer scenes in heaven are found..."
His only hope is that the wind will carry to him tidings from England, "that green gem of the north", from which he has been irrevocably exiled and now can only visit in his dreams. Like the story that preceded it, this poem is constructed of conventional elements but with real mastery both of phrasing and narrative (if not of metre), especially in its refusal to provide explanation: it maintains its mystery by never revealing the nature of the speaker or his exile. "...presently the orchestra commenced a sweet enlivening air that set five couples in motion: it was a cotillon. I rose & offered my hand to Mademoiselle Julie Grisette. she accepted it with delighted surprise & we danced a quadrille with eight others then the set being over refreshments were introduced. I led my partner to a seat & politely handed her the choicest dainties. Again the music sounded & more couples tripped the light fantastic toe to a Swiss tune of extreme harmony. We continued dancing till dawn or day when all separated with the greatest regret & I again returned to my house..."
The Young Men's Magazine came towards the end of Charlotte's first creative outpouring. Although the issues were "published" monthly, her habit of dating her manuscripts means that we know all six were actually written over a period of less than a month in August-September 1830. This stage of writing came to an abrupt end in January 1831 when she was sent to obtain the formal education that would make her fit to earn her own living at Roe Head School, some 15 miles from Haworth. The school's headmistress, Margaret Wooler, was a kindly and intelligent woman who appreciated her student's intelligence and hard work, and Charlotte made a number of life-long friends at the school (including Ellen Nussey, for whom see lots 35-44). Yet her absence from home meant painful banishment from the secret world she shared with her siblings, and she was shouldered with a new burden of responsibility and selfsacrifice, keenly aware of the cost of her schooling and the importance to the family that she should become financially self-sufficient. Her writing became a buried secret, the exuberant imagination that was given full flight in the safety of Haworth became a threat to her equanimity that had to be suppressed. If exceptionally vivid imagination – encompassing both her capacity to give her fantasies a near tangible reality and her taste for the gothic – always remained a chief characteristic of her writing, it was when this imagination was set against the dull reality of dutiful drudgery that her prose flamed into maturity. The pent-up frustration of powerless women was something she began to learn at Roe Head, when she bade farewell for a time to her world of Glass Town. Charlotte Brontë's manuscripts were dispersed in the nineteenth century (see provenance, below) but the vast majority are now in institutional collections in the UK and USA. Two miniature manuscripts were in the collection of Arthur A. Houghton, Jr, sold at Christie's, 13-14 July 1979, lots 53 and 54. One of these is now at the Brontë Parsonage Museum and the other, a three-page miniature manuscript containing two published poems, passed into the collection of William E. Self and was sold at the sale of his library, part 2, Christie's, New York, 4 December 2009, lot 13, for $50,000 (hammer).